This cottage in Dirol in the very center of the Nièvre department, you will discover Burgundy. The Canal du Nivernais passes to his feet, with the newly opened bike path. Ideal for bike and fishing enthusiasts those who like to enjoy life to the waterfront. - 3 bedrooms with a total of: 1 double and 3 single beds (5pers) beds made for the arrival of tourists. Bed, bath, changing table, high chair and baby carriage are provided. Pets welcome. 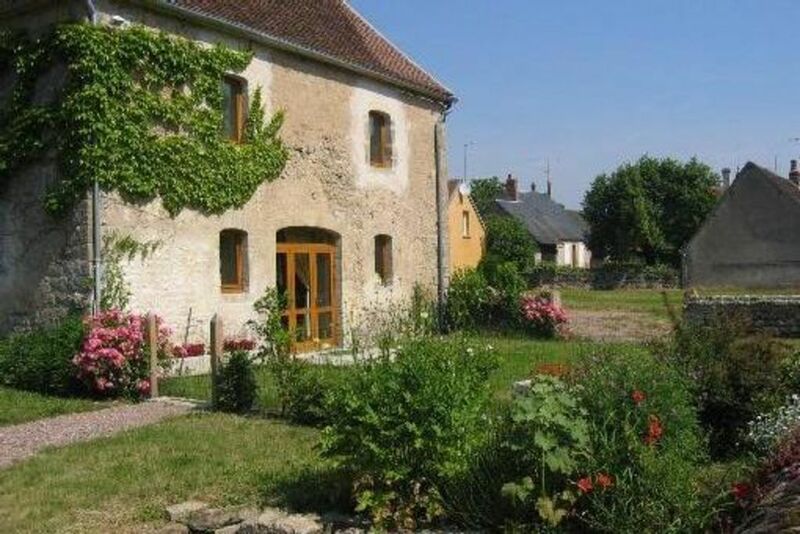 This rental has a terrace and a garden along the Canal du Nivernais offer you a relaxing holiday. The green surroundings, the proximity of the canal where the pleasure boats pass make it a lively and cosmopolitan place that remains silent. kids will enjoy fun outdoors and those who enjoy outdoor living will feel far from the hassle of everyday life. The bathrooms are large, comfortable, tiled. Good quality fittings. towels is provided for 8 euros per person per week. At first, both bathrooms have an electric towel dryer, bath with shower, in one of her shower, bidet, wc. On the ground floor: toilet and shower room can accommodate disabled guests. Nous avons apprécié le charme, l'espace, et le confort offerts par le gîte ainsi que sa situation pour nos projets de balades à vélo le long du canal et le calme de la nature environnante.Nous le recommandons volontiers. Très bien sur toute la ligne. Gîte confortable et spacieux et excellente situation. Les propriétaires sont absolument charmants, merci encore pour les mirabelles! Merci Valérie pour votre appréciation. C'est toujours un plaisir d'accueillir de nouvelles personnes , nous essayons toujours d'avoir les meilleures contacts et sommes sensibles à leurs différents comportements pour qu'elles se sentent à l'aise et libres. Wij hebben een heel fijne vakantie gehad in het huisje in Dirol. Een heel aangename plek dichtbij het Canal du Nivernais. Espace,charme,quiétude,accueil,séjour très agréable à recommander. Environnement très calme et très bucolique,nous reviendrons ! adeptes de la marche à pied et de la bicyclette ! Ganz einfach gesagt: Es war perfekt! Kontakt, Anreisezeit, Schlüsselübergabe: Alles total unkompliziert und freundlich. Lage: Traumhaft (direkt am Kanal an einer alten Zugbrücke). Ruhiger Ort. Wohnung: Sauber, sehr viel Platz, sehr gemütlich. Küche: Kühlschrank mit Eisfach, Microwelle, Gasherd mit einer zusätzlichen E-Kochplatte usw. Alles was man braucht. Nur Besteck und Gläser waren etwas rar. Sehr tolles Haus/Wohnung die wir jederzeit wieder mieten würden. Merci pour votre appréciation; vous étiez des hôtes très sympathiques et respectueux . Shops are 2 km away. Since the lodging, many opportunities for hiking, fishing, mountain biking and boat trip on the canal. Nevers (with Bernadette Soubirous) and Auxerre are not far away and Vézelay and its basilica classified World Heritage Site by Unesco. Then Castle Bazoches, Fontenay Abbey, medieval site of Guédelon Grottes d'Arcy, regional -greniers empty all weekend ..